I feel like I’ve a while without using pistachios in a recipe. By the way, happy (almost) April you guys! Wow, is the year breezing by or what? I can’t believe it’s already almost time for the season changing again. Actually, our weather has been pretty unpredictable the last few days but it looks like it'll be warming up soon. 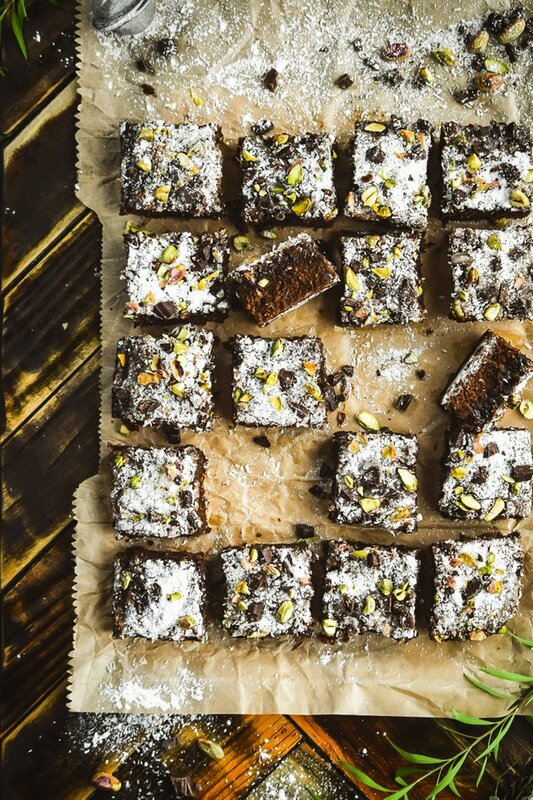 Okay, weather aside, I have to tell you about these wondrously amazing brownies that seriously taste just like almond joys, but with pistachios instead of almonds (which I think I prefer to almonds). My sister is a huge fan of almond joy candies and she completely flipped over these. I honestly don’t remember the last time she raved over a recipe like that because she’s usually not super interested in food compared to the rest of my family. That’s why I feel confident in heavily insisting that you try them. Everyone liked them so much that I’ve already made them a few times since the trial batch. The key ingredient here, and one that I probably overuse in my recipes, coconut milk baby! You put the creamy stuff in the brownies and the icing and it gives them this epic, yet somehow mild, coconut flavor like you won’t believe! Are you drooling yet? So the problem with adding milk, or any liquid to a baked goods is that it makes them more cakey, but coconut milk is so rich and creamy that it’s not a problem. Another thing that keeps these extra soft and fudgy is that you pour the icing on while the brownies cool and it helps keep in the moisture. I used a more liquidy icing the first time I made these and it was so good, but it resulted in brownies too messy to be eaten without a fork so I cut back a little and I think I found the perfect ratio. I will add a note to the bakers that you really want to flour your pan well. I rarely flour my pans and I’ll often skip it when I occasionally use an old cake recipe, but if you want your brownies to have their bottoms after you cut them I recommend this step. Other than that these are pretty straight forward and they’re as easy as any brownie to throw together. 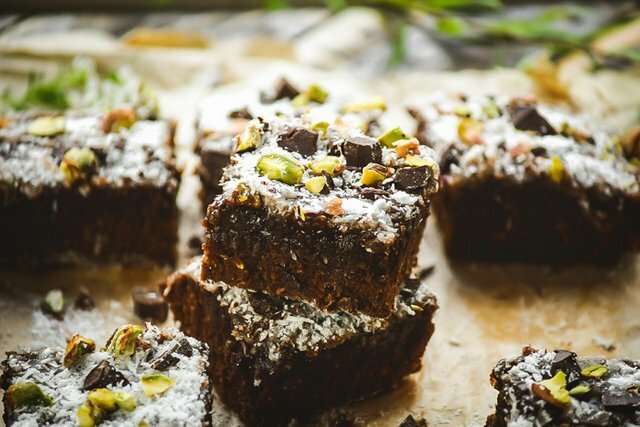 These are definitely what you need to make next time your sugar cravings hit. Brownies are so good on their own but throw in tons of delicious add-ins and you've got something spectacular. Whisk oil with sugar in medium mixing bowl. Add milk, vanilla, salt, and baking powder; mix well. 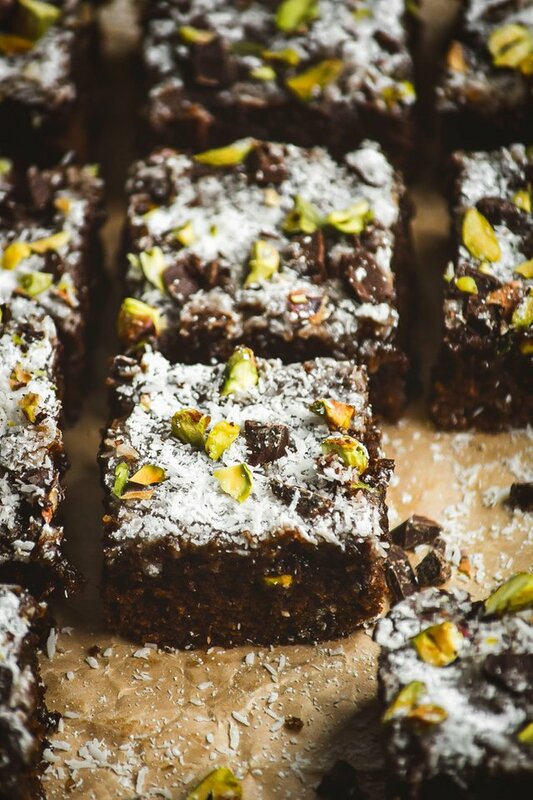 Stir in espresso powder, cocoa powder, flour, and coconut shreds until batter is smooth then add the chocolate chunks and pistachios. Scrape batter into pan with a rubber spatula and spread into a smooth layer. Bake for about 30-35 minutes until a toothpick comes out of center clean. (Stick a toothpick in a few different spots because you will most likely find some of the melty chocolate chunks.) Remove from oven and cool for about 5 minutes. While brownies are starting to cool, whisk powdered sugar with the rest ingredients for the icing until smooth. Pour over brownies while still warm and allow it to set on top (this also helps the brownies not dry out while they cool.) After a few minutes, genlty use a small spatula to spread and even any spots in the center or around the edge where icing might have pooled. 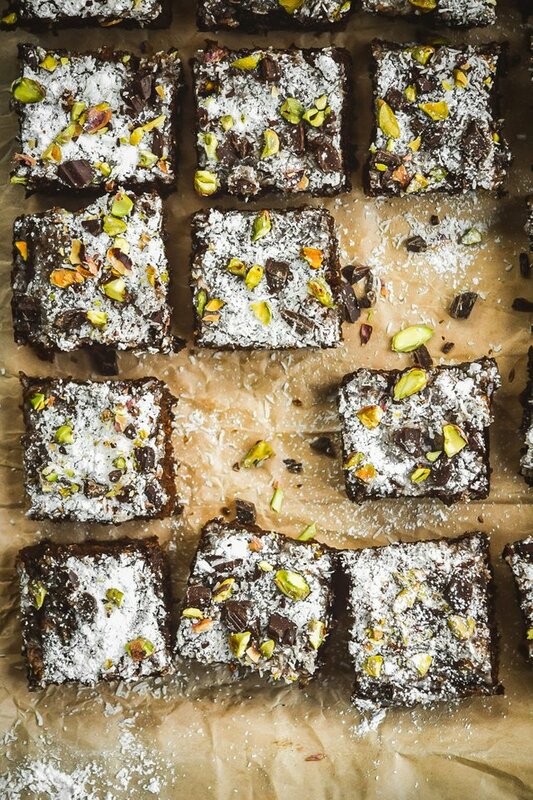 After about 30 minutes, when brownies are nearly cooled, sprinkle on coconut shreds, chocolate chunks, and pistachios. Allow them to finish cooling completely, then cut into squares and serve. 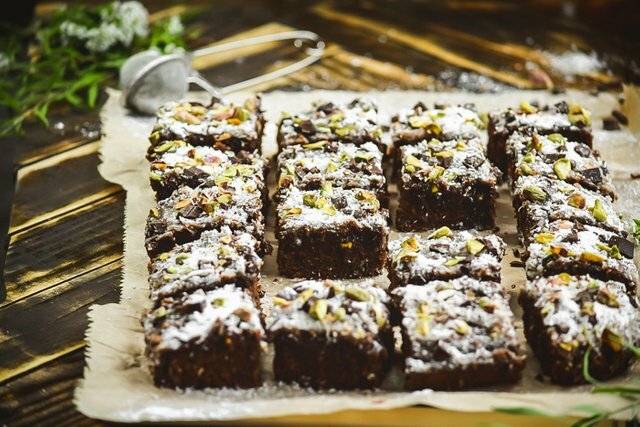 For almond joy clone brownies you can replace the pistachios with almonds! It really is. I hope you get to try. Thanks! Wow! That dessert looks great. Although it has many ingredients, I think it's worth it. The pistachios there must be spectacular. Thanks for sharing. It does. It's a great way to add delicious natural creaminess. What a wonderful combination of everything superb recipe !